I don't know about you, but sometimes I find myself staring at an empty blog post with nothing to write. The little line blinks and blinks but no words flow. Sometimes I have a catchy title but no content, and other times the idea I had ten minutes ago sounds far beyond silly when I start. Anyone else know how that goes? I'm positive I'm not alone here. Fret no more, friends! Your days of struggling to come up with topics are over! At least for a month. Earlier this year I hosted a link up called the Blog Every Day in February challenge. It was certainly a challenge in more ways than one, but so many of you enjoyed it that I thought I'd go for round 2. 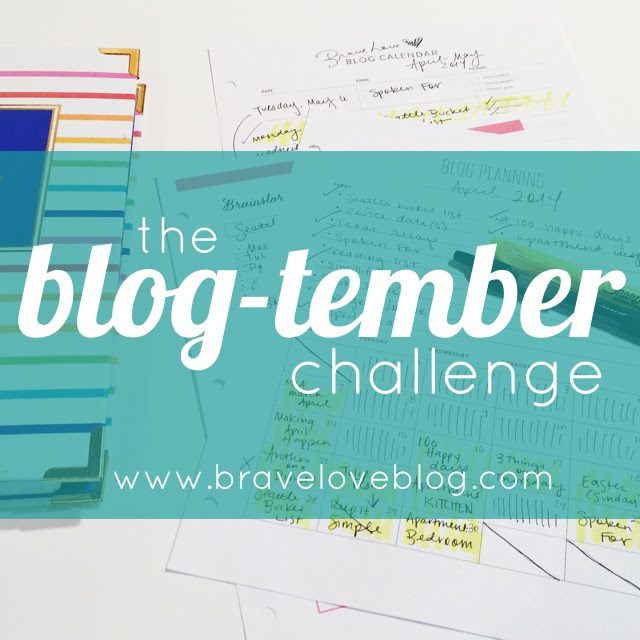 All that being said, I am excited to introduce The Blog-tember Challenge! The Blog-tember Challenge is a daily link up that will begin September 1st. Below I have provided a prompt for every day of the upcoming month --see? I've done all the hard work already ;)-- and each day you will be able to link up with everyone participating. I wanted to share these ahead of time so you can write whenever you'd like! So here is my INVITATION. Won't you join me for the #blogtemberchallenge? The idea of posting every day may seem daunting at first, but with a little prep it will be totally manageable! Feel free to follow one of the prompts, all of the prompts, or none of them. The main goal is to get us all writing together, and we may as well learn more about our favorite bloggers and get to know new ones while we do it! Report back here on next Monday, September 1, with your first update! Sept 1st: Imagine the front sleeve of a hard cover novel. Give us your "About the Author" so we can get to know one another, and for fun tell us what your imaginary novel would be about. Sept 2nd: Write about what makes you happy, from the little joys to the huge game-changers. Sept 3rd: "When I grow up I want to be...." Feel free to answer as your 5-year-old self or as of now. Sept 4th: Pick a fashion trend you love and a fashion trend you hate. Win us over! Sept 5th: "I am passionate about ______________. " Sept 6th: A "currently..." post. Tell us what you're loving, hating, reading, eating, etc. If you want to borrow a list, mine is here. Sept 7th: What's on your current reading list? Or what have you read that you recommend? Sept 8th: Music that moves you. Are you a Spotify addict or a Pandora guru? Tell us your favorite artists/stations! Sept 9th: Let's talk personality types. Introverted? Extroverted? Unsure-troverted? ;) If you know your Myers-Briggs type, tell us about it! If not, you can take this similar test and share your results. Sept 10th: List 10 things that you love about yourself! Let's kick that negative self-talk outta here! Sept 11th: How do you stay inspired? Who inspires you the most? Sept 12th: Tell us about a favorite tradition. It could be a family tradition or from a holiday, university, you-name-it. What makes it so special? Sept 13th: Your current relationship status. If dating/married, give us a glimpse of your story! If single, share about this special season. Sept 14th: When did you start blogging and why? Sept 15th: Make a mood board. Are you brainstorming a room re-do, or are you dreaming of glamping with gal-pals? Share a collage of any kind! (Examples here and here). Sept 16th: "Most people don't know this but..."
Sept 17th: Be brave: make a vlog! Sept 18th: Tell a tale of traveling, a city or country you've been to or a favorite vacation. Sept 19th: If you could give one piece of advice to a large group of people, what would it be? Sept 20th: Share a day in the life. Pictures, timelines, stats, however you like. Sept 21st: Fall Favorites. What do you love most about this season? Sept 22nd: Introduce us to 5 blogs you read on the regular, and tell us why! Sept 23rd: A guide to your city! Share some of the hot-spots and hidden gems of where you live. Sept 24th: Your fall bucket list. What do you want to do before winter rolls around? Sept 26th: How have you changed in the past year? Sept 28th: What were your highs and lows for this month? Sept 29th: What are your go-to blogging resources? What would you recommend to a beginner? Sept 30th: A farewell coffee date. Take some time to breath, sip a warm drink, and share with your new blogging buddies. If you'd like a prompt: how did the Blog-tember challenge go for you? Any surprises? What was your favorite prompt, or what would you like to see included next time? Happy blogging, friends! Let's knock this #blogtemberchallenge out of the park!